Perhaps the love story between you and your future spouse began in Italy, and when you became engaged it seemed natural for you to choose it as the place for your wedding. 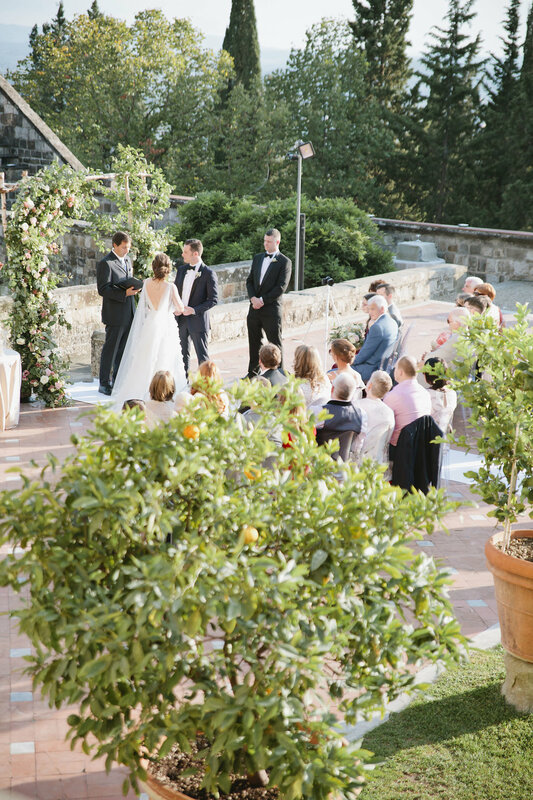 That meeting years ago put Tuscany in a special place in your heart, and to celebrate your matrimony in the enchanting countryside outside Florence, or in one of the many locations in the city of breathtaking beauty would etch those memories indelibly in your mind. Spectacular villas and castles in the countryside surrounded by vast expanses of vineyards and olive groves for a wedding immersed in nature or, in the city, where history surrounds you and where your family and friends can spend time together exploring the thousands of magical places around Florence. Let your choice dictate everything about your wedding; its music, your attire, the food and its colors. For a countryside wedding you might choose the colors of nature as your palette for the event, the silvery greens of rosemary and sage, the lilac of the iris, the bright whites and yellow of tiny wild daisies, or in the summer, the brilliant red of the poppies. The palette of a city wedding might reflect the grandeur of historical places with the colors of ancient tapestries and brocade and the earthy tones of its palaces, yellow ochre, subtle pewter, the color of worn wood and the soft red of terra cotta. Depending on what time of year you decide to hold your countryside wedding, you and your family and guests could take advantage of local fairs called “sagras” that honor local specialties like truffles and mushrooms. A short drive will take you to the nearby countryside to savor local dishes in traditional trattorias far from the crowds of the city, and the surrounds of Florence are filled with marked walking and biking trails. A brisk early morning walk and a picnic lunch with family and friends might be just the thing to ease pre-wedding jitters. Breathe in the cool, countryside air and enjoy the stunning panoramas over Florence. The city holds many mysteries and organizing a sort of pre-wedding treasure hunt would be an enjoyable and educational activity for your family and friends for your city wedding. One thing that you will notice in this place with a long and meaningful history is that there is a tendency to preserve and make note of everything. This is why you will find, beyond sculptures and portraits and streets named after important personalities or events, that there are plaques all over the city with historical references of births and deaths, poetry and curious information and reminders of monumental events of long (and not so long) ago events. The most famous of these plaques are those that quote from the poem by Dante Alighieri The Divine Comedy. In the poem, Dante mentions Florence several times, describing the city as it was in his time. Approximately forty of these plaques are scattered around the Medieval part of the city. Mapping out the plaques could be a pre-wedding day activity that helps everyone get to know the city. There are also plaques that tell us where famous people have lived or died, including famous visitors like Wolfgang Amadeus Mozart, Fyodor Dostoyevsky and many, many more. There are plaques to remember important historical events, like the one in the Loggia dei Lanzi that remembers in Latin that in 1749 Florence finally changed its calendar to reflect every other country in Europe. Until then, the Florentine’s celebrated New Year’s Day on March 25th. Once you have decided on the wedding you desire, we want you to know that it will be a trouble free and enjoyable experience. Pursuant to Italian law, civil weddings can only be celebrated in Municipal environments, that is to say in a city hall or other structure or buildings owned or managed by the city council. But, if you think that these places are plain government offices with bare plaster walls overflowing with piles of documents and files, think again! The truth is, Italian heritage is so rich that many government offices are located inside monumental palaces, and sometimes villas and castles. For example, in cities like Florence and Siena, the “Municipal House” is actually the same palace that hosted the centre of power for centuries. A palace with frescoed walls and ceilings and marvelous furniture, museums visited by hundreds of visitors every day and where a portion has been devoted to accommodate government functions, among which weddings. Dedicated assistance will be provided every step of the way for our “eloping” couples or couples with family and guests to make sure that the entire process is straightforward and extremely smooth. 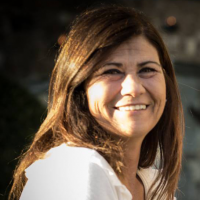 A civil wedding solemnized in Italy will be recognized the world over. To this purpose, a specific procedure must be complied with, which varies according to the nationality of bride and groom. In fact, specific conventions or memorandums of understanding are in place that govern the requirements of a wedding in Italy in favor of foreign nationals. A legally binding wedding certificate will be issued by local authorities, notably the Vital Records Office (Register Office), which the bride and groom will produce in their home country to have their wedding registered. 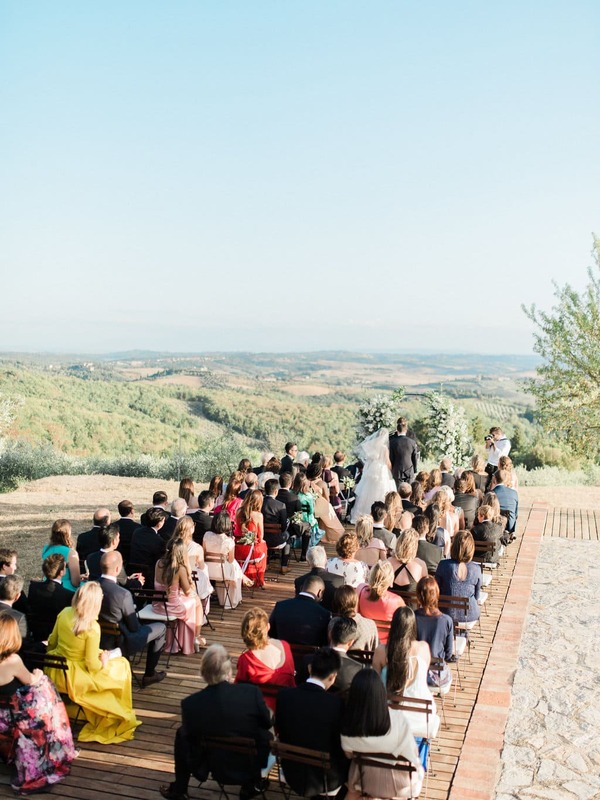 Tuscany offers a thousand and one magical locations for tying the knot and your wedding planner will take care of all the ‘red-tape’ for you, so that you, the bride and groom, have only to relish the time of your life. A wide array of possibilities is available for large wedding parties and eloping couples. You can choose from villas, castles, historic city palaces, or countryside mansions, each providing the atmosphere you seek. It might be a Shakespearean atmosphere for the modern-day Romeo and Juliet, or a truly Renaissance atmosphere. Wherever you choose to tie the knot in Tuscany, be sure that it will be a fairytale to remember!